Here’s how the knife is looking by the way. The class was also a good opportunity to learn some interesting stories, a chance to learn from other people’s experience. 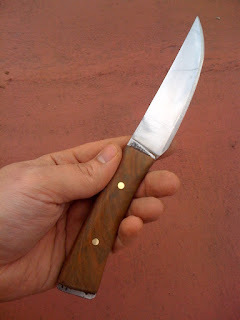 After the 2001 crisis few people could afford the premium knives Mr. Gugliotta made but as he told me, he always managed to get by and put food on the table. He explained that a good knife is valued by most, and he would trade a knife for 30 USD worth of meat at the neighborhood’s butcher store. He also mentioned a good friend of his going on a trip across South America, on foot with his dog. Before the journey, he gave his friend several unfinished blades (missing a proper handle) for him to complete building as he went. Turns out that all across south America the knife was a much appreciated gift, specially in places like the Amazonas. A knife would sometimes get him a dinner and a place to stay for the night. Its not that different here either in the countryside and small towns. People are less reluctant in starting a conversation with a stranger, and people used to hard work appreciate a well made knife. Blacksmithing as a post SHTF trade? This man is among the top 3, most renowned knife and sword makers in the country, yet as he explained, the crisis affected him a lot. How is he getting by now? Much better, but its not only because of his skill with a hammer and anvil, but because of his intelligence and ability to adapt. I’ve said it many times and I keep saying it because as time goes by I find more and more examples, both here and in other countries and places around the world that verify it: We wont go back in time to the middle ages. We wont live like in the “Little house on the Prairie” TV series. Doesn’t matter where in the world, we wont be going back in time, and Mr. Gugliotta, with all his blacksmithing skill and second generation of Katana building experience is the perfect example. After a knife seminar in Brazil next week, he’s organizing a class here for local knife makers. The topic? Its not about being Barter Town’s blacksmith… its about marketing for knife smiths. He sells most of his knives through the web. Finally, the topic every Argentine talks about if the conversation lasts more than 30 minutes: crime. Apparently a famous local gun and knife writer (who’s name shall not be revealed) was involved in a kidnapping. He was surprised along with his wife when leaving a farm (remember me calling BS on country=safe city=hellhole? Examples such as this are why) Two armed men got into the vehicle, forcing him and his wife in the back seat. Sometimes bad guys are clever sometimes they are this stupid. So the gun writer had of course taken a gun with him, but since he’s more of the target shooting and hunting type he had his gun unloaded and carried it in a case. He quietly opened the case, loaded a magazine and loaded the gun, the bad guys didn’t notice him until he had the gun pointed at them. Now here’s where the story gets interesting and there’s a lesson to be learned. I know this man, have read his material and have great respect for him. When I met him face to face, I could see that he’s well educated, kind and polite. I don’t know him that well but based on the few times I’ve seen him he might be just too kind, the type of person that writes about guns and knives, knows well how they operate and could write excellent books about them, but did he seem like the type of guy that would shoot someone (even in self defense) without a second of doubt? I can’t say he seemed to be that type of person, and that’s exactly what happened here. Later when the district attorney asked why didn’t he just shoot the bad guy in the back of the head, he would say he didn’t think it was what a gentleman would have done. I totally picture him saying just that. So he’s had the gun, clearly couldn’t do what he knew perfectly well he should be doing, (shoot to kill) and did what every instructed gun owner knows you should never do (shoot to wound). He alerted the bad guy, and then shot him in the stomach. The car goes off the road, the bad guys pull him out of the car and while on the floor they shoot him in the face. The bad guy that wasn’t shot escapes, leaving his wounded buddy in the car. The wife pulls the wounded kidnapper out of the car, manages to get his husband inside and takes him to the hospital. The older woman breaks her wrist in the process, but still manages to take him to the ER room. The writer is lucky, the projectile went through his face and exited through the back of the head but miraculously he recovered without permanent damage. This is why you should have already come to a decision before finding yourself in a situation where you have a firearm, but you lack the determination to use it as you’re supposed to. Full tang versus partial tang, please share your thoughts. Obviously a full tang is stronger, but a partial tang has less weight & cost. I thought you might go for a more custom-fitted grip, but understand this is a first effort. Historically (Roman Empire), an ounce of silver has been worth a good meal. So if a well-made knife bought your friend a meal & a room for a night, that sounds like it's worth maybe 3 ounces of silver, or close to $60 US. In the early 90's on an adventure in the Adirondack mountains of New York. I ran out of money and so from a stranger I got a tank of gas and $20 for a Cold Steel Tanto. Made it home to Cleveland with a full belly. Say, that's a great knife you have there! It looks like it would be just right for field-dressing a deer. As far as the gentleman mentioned in the story goes, he is very blessed, usually people like that get an obituary notice in the newspaper for their kindness. Reverse grip, edge in - a utility knife. ;) SUUUUURE. Barter Town's blacksmith, that's slightly funny. I watched the original Mad Max film recently. It's not at all like the other Mad Max films. Besides being a somewhat bad film, amazingly, all the criminals in it are unarmed. In a scene where a person probably cannot just rush in with guns a blazing, a crippled old woman uses a double barrel shotgun to corral a number of criminals who kidnapped an infant. Ironically, the infant's parents were surprised while out on a farm in an unguarded moment. One criminal responds by saying, "I don't like guns" mocking the politically correct crowd who wish to whip up fear and hysteria towards gun ownership. However, it's obvious that if the woman didn't posses the gun she would probably be tortured and killed quickly. While the criminals out numbered the two shots from the double barrel, I think it was the way she conveyed her intent to shoot without a doubt that swayed the criminals and not the shotgun alone. She wasn't going to shoot to wound. She seemed like she knew ahead of time what she was willing to do and the other people picked up on this and as a result obeyed her commands. It seemed to me that if the old woman had been uncertain of what she was willing to do ahead of time that would have been telegraphed to the criminals no matter what she said and they might have rushed her to take the gun away. The film also had a scene where a hiding and waiting young criminal threw a wheel cylinder through a passing vehicle he was expecting to pass by. When I saw that I thought this was more along the lines of the types of crimes people cannot prepare for and might be similar to what you might encounter in Argentina. Things like that happen in the U.S. too, thankfully not that often. How much did you pay for the whole knife ferfal including the handle? Greg in CA - I think you need to check your references - daily wages for a common worker were anywhere from 1 to 2 ounces of silver in ancient times - the Roman denarius was about equal to a silver US dime - less than 1/10th of an ounce of silver. And that's what you could get a basic meal for. "the Roman denarius was about equal to a silver US dime"
Was that before or after they debased, shaved off some of the coin? "the Roman denarius was about equal to a silver US dime - less than 1/10th of an ounce of silver. And that's what you could get a basic meal for." The old saying I heard was that, historically, an ounce of silver has been worth a good meal & an ounce of gold worth a fine mens' suit. Greece? Rome? British Empire? Don't have #'s. If an ounce of silver is now worth about $20 US, & Ferfal's friend traded a knife for a good meal ($20?) & a basic motel room ($40-$60?) that's about 3-4 silver ounces. Hey Greg, the knife was traded for a house meal (less than 5 USD for sure) and a place to sleep in the house, not a hotel. I'd say its 20 USD total worth. No hotel will give you a meal, let alone a room, for a knife. You can't really compare silver in a monetary role to today's silver prices (it hasn't been money since 1965). Up until about 100 years ago, 12-15 ounces of silver was equal to one ounce of gold - all the way back to ancient times. Today it's about 60 to one. By historical measures, silver should be over $80/ounce. Given that measure - a dime would be about $7 - or a meal at McDonalds. Put another way, historically (before about 100 years ago), skilled labor went for about 2 ounces per day. In 1914 - Henry Ford upped that to 5 ounces per day (a little less, a silver dollar wasn't quite an ounce). So skilled labor should be able to trade a days worth of work for a lot more than one meal and a bed for the night. Where would he get the other two meals? And this is for skilled, non-farm labor, not unskilled labor. So - to compare the price of an object base on the difference in price between silver in 2010 - and silver before 1914 is comparing apples to oranges - you can do it - but it doesn't mean anything. $15 - that would be 400% inflation in 10 years. Hmmm...Clearly prices for rented rooms & food fluctuate between historic era's & current nations. Also, the market for precious metals is very likely manipulated by govt's & their central banks that try to suppress gold/silver as alternate money. So is the recent spike in gold/silver prices evidence of inflation, or failing price suppression? Likely both. Anyway, I agree that currently using 'a good meal' as a value for an ounce of silver doesn't work (where? which meal?). However the saying has been around so long that there might be something to it. Like that measure is an average, or mean, around which the price moves, never straying too far for long. "So is the recent spike in gold/silver prices evidence of inflation, or failing price suppression?" Add in, loss of confidence & inflation expectations. "using 'a good meal' as a value for an ounce of silver doesn't work"
I'm not sure, but it might work with steak?